Kevin McKenna has been fishing his whole life and has been lucky enough to be located in PORT RENFREW BC, fishing off the west coast of VANCOUVER ISLAND. 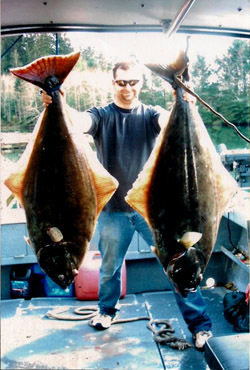 Kevin has over 10 years of professional fish guiding experience out of PORT RENFREW and would love to share his knowledge of the waters with YOU! Kevin lives and breathes the tide and knows the local inshore and offshore waters like the back of his hand, making for a safe and comfortable trip. Kevin has an excellent reputation as a top-producing guide in PORT RENFREW. 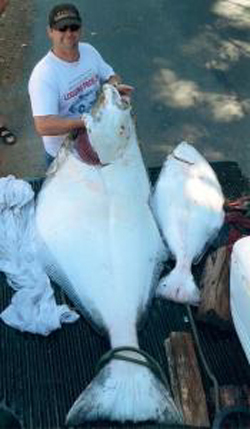 Kevin targets halibut, salmon, and cod from April 15th through October. Al salmon species are available, springs (chinook, kings), coho (silvers), and sockeye when open season. SWIFTSURE BANK is a wonderful place to fish and Kevin loves fishing in the aggressive feeding grounds as the fish migrate through. Kevin's boat is a fully insured, Coast Guard approved 26 foot Northwest Aluminum, with all the top gear such as radar, GPS, Marine Radio, sounder and all required safety gear. A marine head (toilet) is located in the bow of the boat as well. The boat is powered by twin 150 hp Yamaha engines with a 15 hp trolling motor. This boat has great integrity for dealing with the waters offshore and has the capacity to easily fish 4 to 5 men plus himself comfortably. A full day's charter is $1,050.00 and includes up to 4 guests. Each additional guest is $200.00. 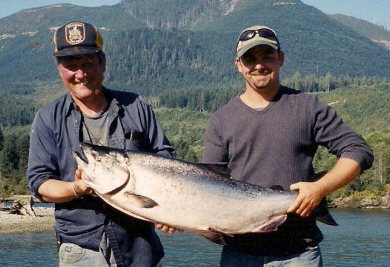 These trips will include full days of salmon and halibut fishing. If you book 2-3 days, the price is $1,000.00 a day for 4 guests. Almost any arrangments, such as accommodations, can be made with enough notice, all you need to do is ask!! When fishing with us you will need to bring warm clothing, rain gear, packed lunch and drinks. A cooler is necessary for transportation of fish. The early work catches the fish, so BOOK EARLY to ensure your fishing adventure with Kevin! Check out Kevin's Facebook page!